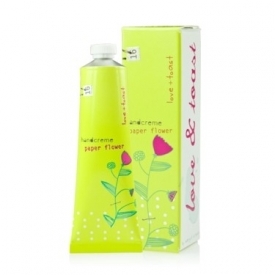 Love & Toast’s Handcreme is made with 97% natural ingredients and is paraben free & vegan friendly. Created to quench thirsty skin, this lightweight lotion contains moisture-rich natural ingredients that absorb quickly into your skin, forming invisible protection against drying environmental conditions. Filled to the brim with good for you Organic Aloe, luxurious Shea Butter, Safflower Seed Oil, Organic Sunflower Oil, Organic Avocado Extract, Olive fruit, Green tea and more. Packaged in a gorgeous, recyclable, printed tube with part of the proceeds going to the Regional Affiliates of Girls Inc. charity. Extracts of Pomegranate and Green Tea in Purified Water, cyclopentasiloxane, stearic acid, isopropyl myristate, cetyl alcohol, glyceryl stearate, PEG-100 Stearate, Butyrospermum Parkii (Shea Butter), persea gratissima (avocado) Oil, tocopheryl acetate (Vitamin E), glycerin, cetearyl alcohol, ceteareth-20, carbomer, tetrasodium EDTA, tocopheryl acetate, phenoxyethanol, caprylyl glycol, ethylhexylglycerin, hexylene glycol, triethanolamine, love and toast botanical perfume blend.